Oops, we’re well into November now, so it’s about time to update you all on my art & culture events during the months of July-September! I know you’ve been eager to read about this and I apologise for the delay! I’ve been rather busy with work as I started a new editing project for a prominent educational publishing house in the Netherlands, but I’ve also been running around London with my camera to photograph my favourite hotspots for a London travel guide. I’ve also had the pleasure of designing a tailor-made Harry Potter-themed London sightseeing tour, writing articles about things to do in London for the MasterCard Priceless Cities website, assisted Connecting Venues and Zinin! Events who organised a 3-day long programme in London for a Dutch company who had their annual company outing for their 120 employees and partners. Furthermore I’ve been working on my new website that will hopefully launch before the end of the year. I sure do know how to keep myself busy! At the start of the Harry Potter tour by Platform 9 3/4. Photo by Karl Stynen. 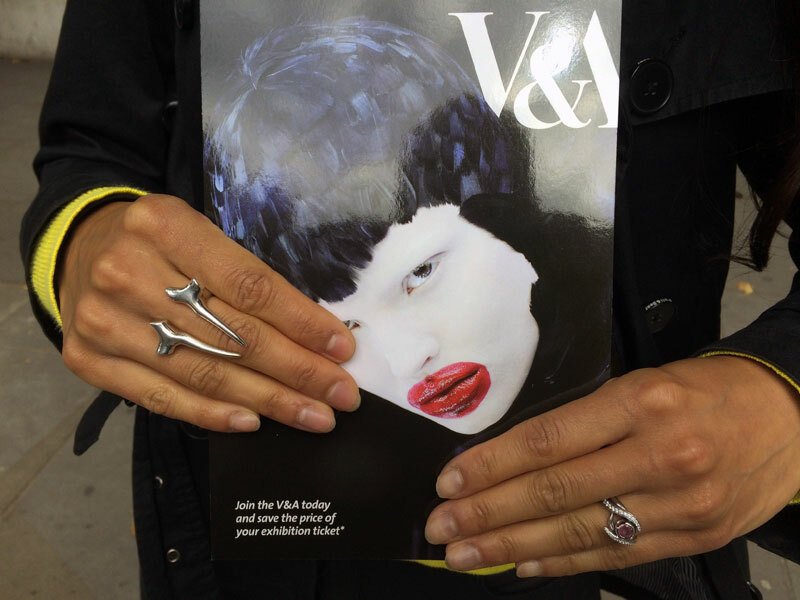 Outside the museum holding the exhibition flyer and showing off two of my Shaun Leane rings. Now at the V&A till January 2016 is Shoes: Pleasure and Pain. A smaller exhibition than the one on Alexander McQueen, but a great collection of so many different types of shoes dating back to 50BC! You can read more about this in my blog post ‘Shoes: Pleasure and Pain at the V&A’ and the Girl Who Has No Shoes. ‘Parakeet’ by Caroline Grooves. Photo by Dan Lowe. The New Pollution by Australian urban artist Ben Frost at StolenSpace Gallery included lots of cheeky artworks like the one of Mr Burns (from The Simpsons) on Viagra packaging below. Click on the image for photos and my review of the exhibition. Another great show at StolenSpace Gallery was their group show ‘LAX/LHR’ they put on in collaboration with Thinkspace Gallery in LA. Featured artists included Shepard Fairey, Ben Eine, D*Face, Snik, RONE, and about 100 more. Again, click on the image below for photos and my review. Last year I wrote about the great retrospective at Howard Griffin Gallery on French artist Thierry Noir, the pioneer of illegal graffiti writing on the Berlin Wall. (You can read that review here.) This summer Thierry Noir returned to the gallery in Shoreditch, east London, and ‘jazzed’ up the place as you can see in the photo below. After Thierry Noir’s show, the gallery space was completely transformed for the immersive show ‘Opens Tomorrow Morning’ by Mexican artist Pablo Delgado. The gallery space was made to look like they were in the middle of installing the next art show, and the artist created a gallery within a gallery, blurring the lines between fiction and reality. Visitors were supposed to grab one of the torches upon entering the pitch-dark space which I didn’t notice, so after stumbling around in the dark had to I use the torch on my phone. Hidden among the tins of paint, strings and empty picture frames were Delgado’s famous mini-paintings, drawings made with special UV paint and even a sleeping cat toy that made purring sounds. Since 1769 the Royal Academy of Arts have held their annual Summer Exhibition. This year I visited it for the first time and I saw some great works on display, including this hand-taped staircase by Jim Lambie, but also some truly horrible works of art. The great thing about the Summer Exhibition is that submission is open to both established but also amateur artists. This doesn’t mean that all works are necessarily good though. Until 13 December 2015 you can see the great Ai Wei Wei Retrospective at the Royal Academy. Click on the image below for photos and my review. The works of sculptor Duane Hanson at the Serpentine Gallery were so life-like that they were rather unsettling. I especially found this baby in a stroller rather creepy. I expected any minute for one of the realistic sculptures to come alive and also mistook one of the other visitors for a sculpture! Click on the image below for more photos and my review of the show. During the Shoreditch Design Triangle week, I popped down for a drink at ‘A Proper East End Pub’ at Gallery S O by my friend Danny Clarke and his mate Clark Clerin. Together they recreated an East End pub as they used to look like when they were growing up, entirely out of cardboard, from the tables to the condom machine in the toilets! Gallery S O on 92 Brick Lane, housed in the last Jewish shop in the street: CH. N. Katz, which was a string and paper bag supplier. It closed in the 1990s after 57 years. Artangel is famous for curating and commissioning exceptional art projects in surprising or exclusive locations. This was certainly true for the show The Two Eyes Are Not Brothers by filmmaker Ben Rivers, which was set in the Television Centre in White City, London. In several parts of the building there were film projections of old 16mm footage of Morocco’s Atlas Mountains and iconic London backdrops. The most interesting part of this show to me was actually the building itself. While it’s due for demolition at the moment, in the past it was used by the BBC to make the props and scenery for their TV dramas. There were still some old machinery and bits and pieces left that were used in the past which was very interesting to see. Over the month of September the famous 19th century market building Covent Garden was filled with 100,000 giant balloons, the first public art installation by French artist Charles Pétillon. This installation was part of Pétillon’s ‘Invasions’ series in which he invades buildings and spaces with white balloons. 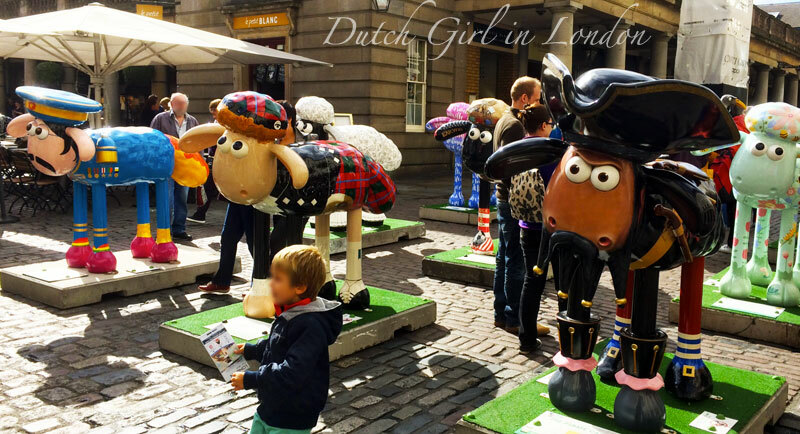 My visit to the balloon sculpture coincided with an invasion of Covent Garden by a flock of Shaun the sheep. These 120 sheep sculptures had travelled many miles from Bristol to London before they were auctioned to raise money for sick children in hospitals around the UK. The auction raised over £1 million! You can read all about the cause, see photos and make donations on the website Shaun in the City. In September I made a short trip to the Netherlands and visited the exhibition on the Italian filmmaker Michelangelo Antonioni at EYE Film Museum. Click on the photo below for photos and my review. In September I also travelled up north to Hull near the east coast of England. More about this trip will follow on the blog, but for now I wanted to share with you this fantastic photo of a mermaid I took at the National Maritime Museum. This is definitely the best museum sign I have ever seen! Back in the day when trade and explorations took place over water, seafarers believed in mythological figures such as mermaids. From at least the 16th century people would manufacture mermaids, often using a small monkey skeleton, fish tail and wires, to showcase or sell to collectors. This number one bestselling novel has proven very successful and it’s no surprise it’s been made into a film (due in October 2016). The book is a real pageturner and has been described as Rear Window meets Gone Girl, which I find quite accurate. The novel follows Rachel who makes a daily train commute into London. From the train she observes the lives of one particular couple, but then one day she discovers there’s something wrong. While she tries to reveal the truth, the reader gets sucked in the story. I’m certainly looking forward to seeing the film adaptation next year! This book was kindly given to me by fellow-Dutchie and namesake, literature & theatre critic Zarina. I absolutely loved this book and it’s one of the funniest books I’ve read in a while! The novel tells about the return of Jesus, in the form of carpenter Joshua, to Earth for the Apocalypse, which takes place next Tuesday. Satan (who looks exactly like George Clooney) is recruiting his horsemen while Archangel Gabriel is occupied with his earthling lover and sacrificed his angelic being to be with her. A definite must-read, if you can appreciate a humorist take on the Bible that is! Another donation by above-mentioned Zarina. The book is about Emma who turns 30 in a few months time. She finds a bucket list she and her friends compiled 15 years ago and decides to tick off the aspirations they had then before she hits the big 3 0. A fun read, but not that memorable. I hope this post inspired you to read my recommended books or see some of the exhibitions and galleries I mentioned. Stay tuned for my Film, Food, Music & Dance and Travel overview for the months July-September! Posted in art, culture and tagged art, books, exhibition, gallery, graffiti, literature, live music, museum, street art, urban art. Bookmark the permalink.